If your shop hasn’t acquired a new press brake in the last few years, odds are that the sheet and plate forming area of the shop is on its way to becoming a bottleneck. With the pace of material movement through shops quickening each and every day, thanks in large part to the unreal productivity from new laser- and plasma-cutting machines, shops cannot afford to face throughput hurdles thrown up by old, slow and inaccurate press brakes. Have no fear—there is no shortage of new press-brake offerings equipped to handle the rapidly increasing pace of material flow. Operators can view setup sheets on the CNC screen, rather than mess with clumsy and perhaps out-of-date part drawings. And many manufacturers have devised clever onboard aids also designed to quicken setups. Tooling can be staged right on the press brake, and can be changed automatically. In-process bend-angle measurement and adjustment can eliminate extra hits and minimize scrap. Here’s a sample of what’s become available to metalformers in the last year or two. 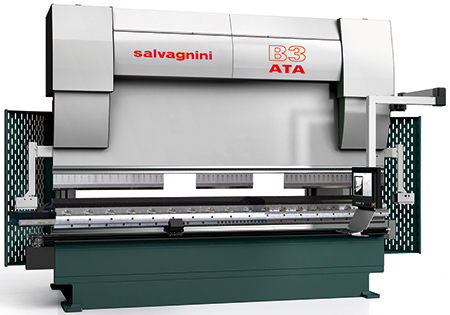 Lean manufacturing comes to press-brake operations with the introduction of Salvagnini’s B3.ATA press brake, which automatically adjusts tool length, V-die opening and backgauges to accommodate the next operation or the next part in a kit-production sequence. Automatic tool adjustment, via the proprietary SiX controller, frees operators from decisions about which tooling and which tool station to use. Bending accuracy is ±2 microns, due to the built-in angle-measurement system that performs real- time checks on parts during bending—without increasing cycle time. Measurements are communicated to the controller which, using previously recorded springback values for the workpiece material, signals the necessary adjustments. First-bend accuracy to within ±0.5 deg. 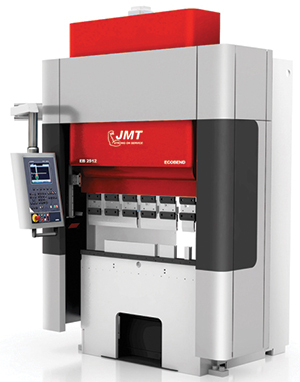 JMT’s new Eco Bend electric press brakes, called ideal for cramped shops where floor space is at a premium, have a compact footprint, run quietly and draw relatively little power while idle. The unique frame design keeps the bending beam precisely parallel to the die. Models range from 4 to 10 ft. in length, with capacity from 28 to 112 tons. The Eco Bend 10030 is the largest machine in the series, with a 10-ft. maximum bending length and 112 tons of bending force. Energy consumed to manufacture parts reportedly is on the order of less than 40 percent the power consumption of a conventional press brake of equal size. Due to the on-demand servo-motor-driven concept, the brakes’ electric motors run only while needed. 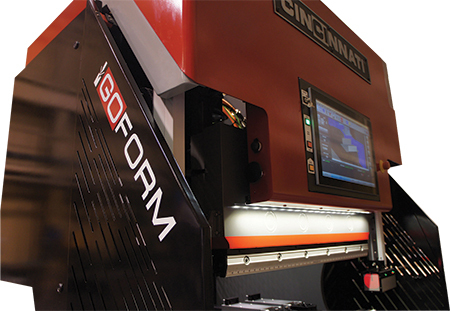 This new Goform 40-ton electric press brake from Cincinnati Inc. is touted as perfect for small parts to 0.25-in. thick and weighing less than 50 lb. It provides a 10-in. stroke and 17-in. open height for jobs requiring tall tools and adapters, and boasts a six-axis backgauge to take on complex part shapes. The brake’s heavy-duty stress-relieved frame is designed to handle full-tonnage forming with minimal deflection, and its drive system uses satellite roller-screw actuators that minimize heat and wear for a long life of heavy use. The machine has a small footprint and weighs just over 6000 lb. to allow it to be easily moved with a forklift or overhead crane, and operates without being anchored to the floor, so it can readily adapt to changing plant layouts and workflows. And, it can be configured to use the three major tooling styles—American, WT/New Standard and European. The Wilson Tool Express Die Holder uses a full-length clamp, rather than multiple setscrews, allowing the use of segmented dies anywhere along the length of the bed. Programs can be created on the control or offline with Cincinnati’s Bend Simulation Module. Pre-loaded tool files simplify programming and improve first-bend accuracy. 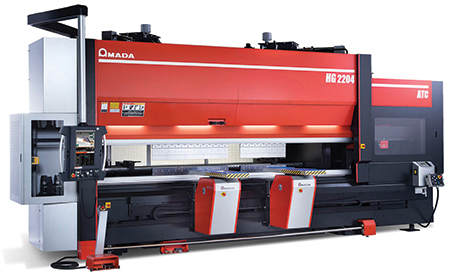 Equipped with a patented automatic tool changer, Amada’s new HG 2204 ATC press brake ensures quick and precise automated tool changes. The automated setup and repeatable accuracy achieved by the HG ATC enables fabricators to introduce rush jobs seamlessly. Designed to handle variable lot sizes and complex tool layouts, the automatic tool changer loads new tools within 3 min. And, the HG's 13-ft. bed facilitates multistage bending operations and supports bend lengths to 161.4 in. Other standard features include an integrated bend sensor that guarantees consistent bend-angle accuracy. 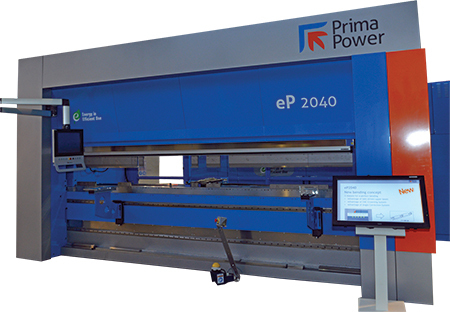 On average, machines in the latest Prima Power eP-series servo-electric press brakes consume 50 percent less power than hydraulic press brakes, say company officials. The brakes also require less maintenance, (Prima Power calls this Green Means). The press brakes employ a pulley-belt system designed to distribute the applied bending force over the entire bending length, while a rigid and stable O-frame ensures optimum tool alignment. Ram-position accuracy and repeatability are bolstered by bed-referenced linear encoders that measure the relative positions of the upper and lower beams. Press brakes in the eP series have no throat limitations, enabling bending of long parts. There are four models in the lineup—the eP-0520 (550-kN bending force, 2020-mm bend length), eP-1030 (1050 kN, 3060 mm)), eP-1336 (1350 kN, 3655 mm) and newest model, the eP-2040 (2000 kN, 4080 mm). 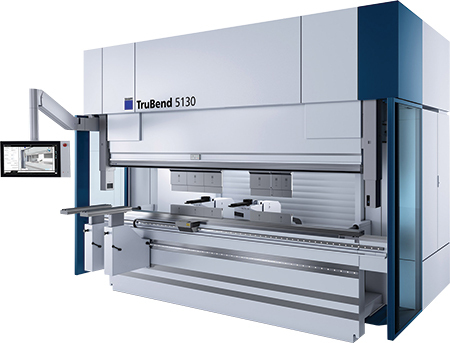 High axis speeds and acceleration rates, combined with innovative operating aids, lead to unparalleled productivity with Trumpf’s new TruBend Series 5000 press brakes, in four models from 500- to 1700-kN bending force and 1275- to 3230-mm bending length. Each features a new on-demand servo drive with four-cylinder drive technology. To ensure bend-angle precision, the brakes provide two innovative angle-measuring systems: automatically controlled bending (ACB) collects measurements through sensors integrated into the upper tool and the ACB Laser system measures bend angle using a contactless optical process. Use the ACB setup for bending short sides, reflective surfaces, or when multipoint measurement is required, and use the ACB Laser system when processing acute and open angles, as well as for bending thick material. The entire bending process is facilitated by the Touchpoint TruBend control concept—an intuitive interface that features realistic 3D visualization and a multi-touch screen. And, a tool indicator features LED lights that help to reduce setup times by precisely displaying bending-tool location. 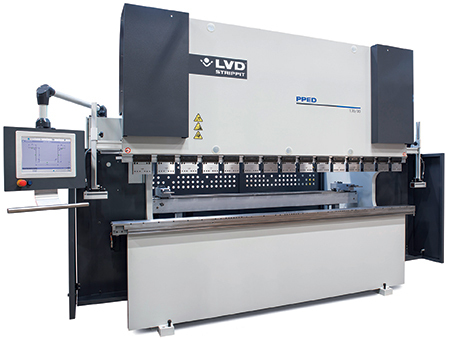 LVD Strippit introduces a range of press brakes to its bending-product line, the PPED series of hydraulic brakes that feature a CNC crowning system and a 15-in. version of its Touch-B CNC controller. With minimal input, an operator can create designs in 2D and simulate in 3D. The machines come in three models, with bend force from 50 to 320 metric tons and bend lengths from 78 to 157 in. The largest model, the PPED-7, is equipped with a standard crowning system—sheet thickness, bend length, punch radius, die opening and material data are entered into the control to determine the amount of crowning required. Also new: Synchro-Form adaptive bending technology, which automatically maintains angular consistency and the required geometric profile when bending large parts with multiple bends. A laser scanner sends measurement data to the Touch-B control, which then directs the required adjustments to part and ram position, compensating as needed with each bend strep. Synchro-Form is integrated into the firm’s Synchro-Form series of press brakes. 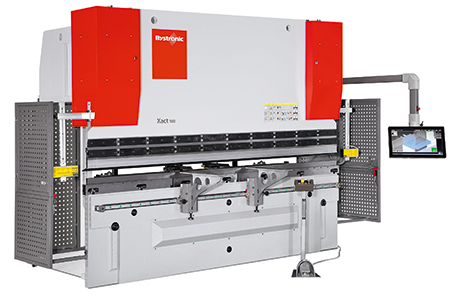 Described as easy to set up and program, the Bystronic Xact Smart press brake combines high bend accuracy with advanced features, including the ByVision bending control system that includes a 22-in. high-definition touchscreen to display realistic 3D part animations. Operators gain 3D visualization of part processing, simulation of bending cycles and collision monitoring. A software-driven menu guides operators through a step-by-step bending process, and automatically specifies bend sequences to make programming simple and intuitive. The brakes are available in several models with capacities from 100 to 225 tons, and up to a four-axis backgauge. Standard active hydraulic crowning optimizes bend-angle accuracy across the entire bed length. 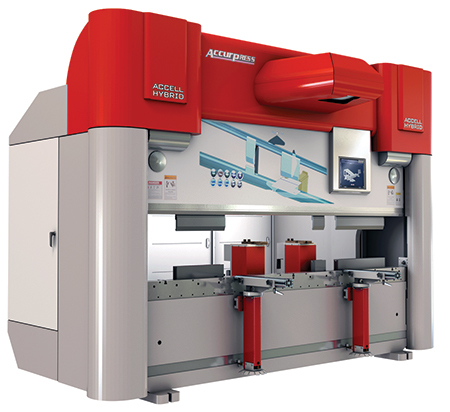 Introducing the Accurpress Accell Hybrid press brake, which uses a combination of electric and hydraulic drive systems to create a quiet and efficient machine. The machine’s electrohydraulic system combines the advantages of both drive technologies—it is powerful and durable and, because all the components are compactly integrated, it results in a clean, leak-free machine. those 3D designs permits you to understand the skillability of your architect and additionally assist architectural companies through attracting greater companies. all over again, it's miles a win-win case for everyone concerned.